Spring is coming and with it will come lots of baby birds. I have enjoyed baby killdeers since I was very young and used to see them on our farm east of Rigby, Idaho. 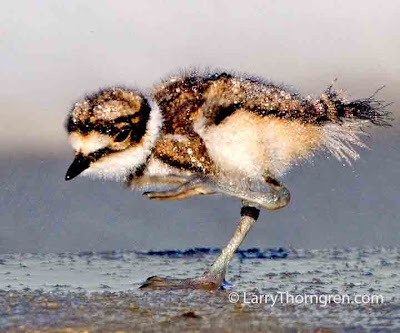 I took this photo of a baby killdeer cooling off in the spray from a lawn sprinkler, as I passed through Kuna, Idaho two years ago, on my way to look for burrowing owls in the Birds of Prey Area south of there. This little guy was rubbing off excess water with its' foot.